On January 27, 2011, at the age of 82, Calvin Collins successfully debuted the most challenging project of his career: a stage set blending the architectural styles of both Elizabethan England and the 1920s Harlem Renaissance. It’s hard to imagine two styles more different, so finding a way to unite them artistically seems difficult at best. But Calvin intuitively saw the common ground. Born in a quiet Louisiana farming community, Calvin, at age 17, had embarked on a journey that would take him around the world: to World War II shipyards in the northwest; to New Jersey for military training; to New York City and Europe for military service. By the time he made it back to Louisiana to settle in New Orleans, Calvin had been exposed to a wide variety of cultures, and different ways of thinking, building and living. Following his military service, Calvin transferred his talent for building into a career in construction. But it wasn’t until he retired that his real artistry unfolded and he nurtured his passion for woodworking. Calvin’s years of life experience found a creative outlet in wood as he hand crafted intricate pieces of custom furniture, graceful spiral staircases, boats, even beautiful instrument cases for his musician friends. seem worlds apart. And so the stage was set. It’s impossible to chart the influences that make Calvin so good at what he does. We can be certain, however, that Calvin’s work is a clear demonstration of the excellence that only comes through experience. 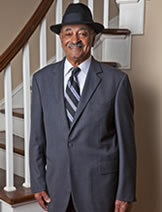 Calvin Collins… Peoples Health Champion.